Transitional cell carcinoma of the renal pelvis and ureter, or upper tract transitional cell carcinoma, is an uncommon disease for which specific epidemiologic data are not available (1). Tumor stage and grade remain the major prognosticators of recurrence and survival. The upper urinary tract may have patchy involvement by carcinoma in situ, and multifo-cality is common (2,3). Carcinoma in situ of the upper urinary tract has an incidence of 23% in nephroureterectomy specimens, and the incidence of upper tract transitional cell carcinoma appears to be increasing (4). Of patients with a history of bladder transitional cell carcinoma, 4% to 21% develop upper tract transitional cell carcinoma during 15-year follow-up (5,6). Conversely, approximately 25% to 75% of patients first presenting with upper tract transitional cell carcinoma subsequently develop de novo bladder transitional cell carcinoma (7,8). Patients with a history of transitional cell carcinoma in any location have a high risk of subsequent recurrence in a residual ureteral orifice or retained ureteral stump (8). Endoscopic and laparoscopic techniques have dominated efforts to minimize the morbidity associated with radical removal of the kidney, ureter, and bladder cuff for treatment of upper tract transitional cell carcinoma. Because the first endourologic approach to the distal ureter was proposed in 1952 (9), numerous other minimally invasive approaches to the distal ureter and bladder cuff have been described (10). Clayman et al. 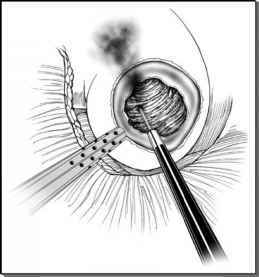 reported the first laparoscopic approach to nephroureterectomy in 1991 (11). These initial procedures had long operative times, but patients experienced less perioperative morbidity than those undergoing open nephroureterectomy (12). Approximately 400 patients have been reported as having undergone the procedure via conventional transperitoneal (13-17), conventional retroperitoneal (18-21), hand-assisted transperitoneal (22-25), and hand-assisted retroperitoneal (26,27) approaches with a variety of laparoscopic, endo-scopic, and open surgical methods for excision of the distal ureter and bladder cuff. Few publications have reported the long-term results of therapy for upper tract transitional cell carcinoma in a substantial number of patients (2); fewer still have reported the long-term results of laparoscopic radical nephroureterectomy. Most of the literature on laparoscopic radical nephroureterectomy is dominated by small, single-institution series of 25 or fewer patients, with a handful of larger series (14-16,18,23,27). This chapter will review the current status of laparoscopic radical nephroureterectomy, in specific regard to the various approaches to the upper tract and bladder cuff, morbidity, oncologic outcomes, port site, and ureteral stump recurrences.